The first "pulp" was Frank Munsey's revamped Argosy magazine of 1896, with about 135,000 words (192 pages) per issue, on pulp paper with untrimmed edges, and no illustrations, even on the cover. The steam-powered printing press had been in widespread use for some time, enabling the boom in dime novels; prior to Munsey, however, no one had combined cheap printing, cheap paper and cheap authors in a package that provided affordable entertainment to young working-class people. In six years, Argosy went from a few thousand copies per month to over half a million. Street & Smith, a dime novel and boys' weekly publisher, was next on the market. Seeing Argosy's success, they launched The Popular Magazine in 1903, which they billed as the "biggest magazine in the world" by virtue of its being two pages (the interior sides of the front and back cover) longer than Argosy. Due to differences in page layout however, the magazine had substantially less text than Argosy. The Popular Magazine did introduce color covers to pulp publishing, and the magazine began to take off when in 1905 the publishers acquired the rights to serialize Ayesha, by H. Rider Haggard, a sequel to his popular novel She. Haggard's Lost World genre influenced several key pulp writers, including Edgar Rice Burroughs, Robert E. Howard, Talbot Mundy and Abraham Merritt. In 1907, the cover price rose to 15 cents and 30 pages were added to each issue; along with establishing a stable of authors for each magazine, this change proved successful and circulation began to approach that of Argosy. 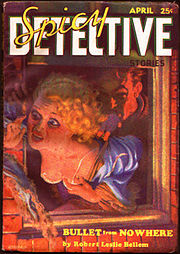 Street and Smith's next innovation was the introduction of specialized genre pulps, with each magazine focusing on a particular genre, such as detective stories, romance, etc. At their peak of popularity in the 1920s and 1930s, the most successful pulps could sell up to one million copies per issue. In 1934, Frank Gruber (writer) said there were some 150 pulp titles. The most successful pulp magazines were Argosy, Adventure, Blue Book and Short Stories, collectively described by some pulp historians as "The Big Four". Among the best-known other titles of this period were Amazing Stories, Black Mask, Dime Detective, Flying Aces, Horror Stories, Love Story Magazine, Marvel Tales, Oriental Stories, Planet Stories, Spicy Detective, Startling Stories, Thrilling Wonder Stories, Unknown, Weird Tales and Western Story Magazine. Although pulp magazines were primarily an American phenomenon, there were also a number of British pulp magazines published between the Edwardian era and World War II. Notable UK pulps included Pall Mall Magazine, The Novel Magazine, Cassell's Magazine, The Story-Teller, The Sovereign Magazine, Hutchinson's Adventure-Story and Hutchinson's Mystery-Story. The German fantasy magazine Der Orchideengarten had a similar format to American pulp magazines, in that it was printed on rough pulp paper and heavily illustrated. During the Second World War paper shortages had a serious impact on pulp production, starting a steady rise in costs and the decline of the pulps. Beginning with Ellery Queen's Mystery Magazine in 1941, pulp magazines began to switch to digest size; smaller, thicker magazines. In 1949, Street & Smith closed most of their pulp magazines in order to move upmarket and produce slicks. The 1957 liquidation of the American News Company, then the primary distributor of pulp magazines, has sometimes been taken as marking the end of the "pulp era"; by that date, many of the famous pulps of the previous generation, including Black Mask, The Shadow, Doc Savage, and Weird Tales, were defunct. Almost all of the few remaining pulp magazines are science fiction or mystery magazines now in formats similar to "digest size", such as Analog Science Fiction and Fact and Ellery Queen's Mystery Magazine. The format is still in use for some lengthy serials, like the German science fiction weekly Perry Rhodan (over 3,000 issues as of 2019). While the majority of pulp magazines were anthology titles featuring many different authors, characters and settings, some of the most enduring magazines were those that featured a single recurring character. These were often referred to as "hero pulps" because the recurring character was almost always a larger-than-life hero in the mold of Doc Savage or The Shadow. Pulp covers were printed in color on higher-quality (slick) paper. They were famous for their half-dressed damsels in distress, usually awaiting a rescuing hero. Cover art played a major part in the marketing of pulp magazines. The early pulp magazines could boast covers by some distinguished American artists; The Popular Magazine had covers by N.C. Wyeth, and Edgar Franklin Wittmack contributed cover art to Argosy and Short Stories. Later, many artists specialized in creating covers mainly for the pulps; a number of the most successful cover artists became as popular as the authors featured on the interior pages. Among the most famous pulp artists were Walter Baumhofer, Earle K. Bergey, Margaret Brundage, Edd Cartier, Virgil Finlay, Frank R. Paul, Norman Saunders, Nick Eggenhofer, (who specialized in Western illustrations), Hugh J. Ward, George Rozen, and Rudolph Belarski. Covers were important enough to sales that sometimes they would be designed first; authors would then be shown the cover art and asked to write a story to match. Some pulp editors became known for cultivating good fiction and interesting features in their magazines. Preeminent pulp magazine editors included Arthur Sullivant Hoffman (Adventure), Robert H. Davis (All-Story Weekly), Harry E. Maule (Short Stories), Donald Kennicott (Blue Book), Joseph T. Shaw (Black Mask), Farnsworth Wright (Weird Tales, Oriental Stories), John W. Campbell (Astounding Science Fiction, Unknown) and Daisy Bacon (Love Story Magazine, Detective Story Magazine). Many of the paperback houses that contributed to the decline of the genre–Ace, Dell, Avon, among others–were actually started by pulp magazine publishers. They had the presses, the expertise, and the newsstand distribution networks which made the success of the mass-market paperback possible. These pulp-oriented paperback houses mined the old magazines for reprints. This kept pulp literature, if not pulp magazines, alive. The Return of the Continental Op reprints material first published in Black Mask; Five Sinister Characters contains stories first published in Dime Detective; and The Pocket Book of Science Fiction collects material from Thrilling Wonder Stories, Astounding Science Fiction and Amazing Stories. But note that mass market paperbacks are not pulps. In 1992, Rich W. Harvey came out with a magazine called Pulp Adventures reprinting old classics. It came out regularly until 2001, and then started up again in 2014. In 1994, Quentin Tarantino directed the film Pulp Fiction. The working title of the film was Black Mask, in homage to the pulp magazine of that name, and it embodied the seedy, violent, often crime-related spirit found in pulp magazines. In 2010, Pro Se Press released three new pulp magazines Fantasy & Fear, Masked Gun Mystery and Peculiar Adventures. In 2011, they amalgamated the three titles into one magazine Pro Se Presents which came out regularly until Winter/Spring 2014. ^ a b Server, Lee (1993). Danger Is My Business: an illustrated history of the Fabulous Pulp Magazines. San Francisco: Chronicle Books. pp. 62–65. ISBN 978-0-8118-0112-6. ^ Hutchison, Don (1995). The Great Pulp Heroes. Mosaic Press. ISBN 0-88962-585-9. ^ Hulse, Ed (2009). The Blood 'n' Thunder Guide to Collecting Pulps. Muriana Press. pp. 26, 163. ISBN 978-0979595509. ^ Robinson, Frank M., and Davidson, Lawrence. Pulp Culture – The Art of Fiction Magazines. Collectors Press, 2007. ISBN 1-933112-30-1 (p.42). ^ The Adventure House Guide to the Pulps, edited by Doug Ellis, John Locke, and John Gunnison. Silver Spring, MD, Adventure House, 2000. (p. xi–xii). ^ John A. Dinan, Sports in the Pulp Magazines. McFarland, 1998, ISB0786404817 (pp. 130–32). ^ Bleiler,Richard "Forgotten Giant: Hoffman’s Adventure". Purple Prose Magazine, November 1998, p. 3-12. ^ Sampson,Robert. (1991) Yesterday's Faces:Dangerous Horizons Popular Press, 1991, (p.87). ^ Locke, John ed. “Editors You Want to Know: Daisy Bacon” by Joa Humphrey in Pulpwood Days: Editors You Want to Know. Off-Trail, 2007. ISBN 0-9786836-2-5 (p. 77). Daisy Bacon (1899?–1986) was nicknamed "Queen of the Woodpulps". ^ Schorer, M. Sinclair Lewis: An American Life, pp. 3–22. McGraw-Hill, 1961. ^ "They Came from the Newsstand: Pulp Magazines from the Browne Library". Browne Popular Culture Library News. Bowling Green State University. May 31, 1994. ^ Stephensen-Payne, Phil (2018). "Pulp Adventures". Magazine Data File. ^ "Pulp Fiction". October 14, 1994 – via IMDb. ^ "DC Thomson Shop – Home Page". Dcthomson.co.uk. Archived from the original on August 18, 2010. Retrieved December 8, 2010. Wikimedia Commons has media related to Pulp magazines.